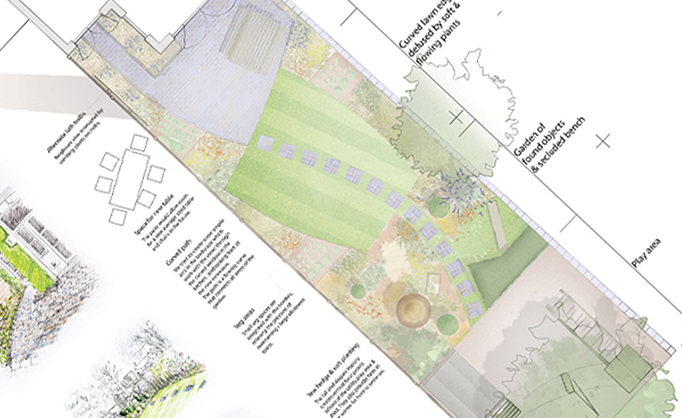 Design Process – Introduction – We create gardens that offer a place to be social, a place for people to live and pursue interests, and a place to relax and revitalise. We focus on simple refined lines and balanced structure. Our aim is to create stunning planting which becomes the focus of a detailed and practical landscape. This means that we always try to offer seasonal interest, and we choose species and cultivars that are tried and tested to deliver strength, colour and reliability over the years. By using a refined materials pallet, simple geometry, balanced plants and specimen trees, our goal is to make the garden and house feel ‘knitted together’, like they have always been there. How do we do this? We use a number of elements to design a space. Reflecting On Your Garden Space – As garden designers, one of the skills we develop is the ability to feel what kind of changes or new elements your landscape needs. Our priority is to make the garden feel right. Focal Points – Focal points often work best when they are subtle elements like specimen trees or climbing plants. It might be a body of water, reflecting the sky, or even a piece of sculpture in the space. Sometimes as designers we choose to add an element into a garden which is very simple like a white wall which might provide a backdrop to a specimen tree which lifts it from the background of green foliage, and focuses our attention on it. We think this awareness of balance is an essential part of garden design. Gardens Develop Over Time – Our designs take into account that gardens take several years to mature once built and planted, but when the materials fade and begin to take on a strength of character, and when the trees and plants begin to have more and more presence in the space, this is when the garden comes into its own. Views – We believe that any space in any location can be beautiful, and feel right. If your landscape is surrounded by beautiful views, then it would make sense to draw our attention outwards with the design, but if your garden is over looked by other houses, with little natural light flowing in, then it is important to create internal focus. In this sense it doesn’t matter what size of garden, or location you have, what matters is to approach each and every space on its merits. Please click ‘Design Process and Fees’ to read more. Please click ‘gallery’ to view more photos.